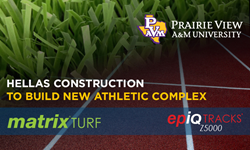 Hellas Construction will begin work at Prairie View A&M University next week for the construction of a football field, running track, and field events facility to be completed in 2016. The upcoming athletic building will be used by the NCAA Division I university’s Track and Field Program and the future United States Olympic Team for their Rio 2016 Summer Olympics training. Hellas Construction to Build New Athletic Complex at Prairie View A&M University. I am extremely happy to be able to work with Prairie View A&M University again. 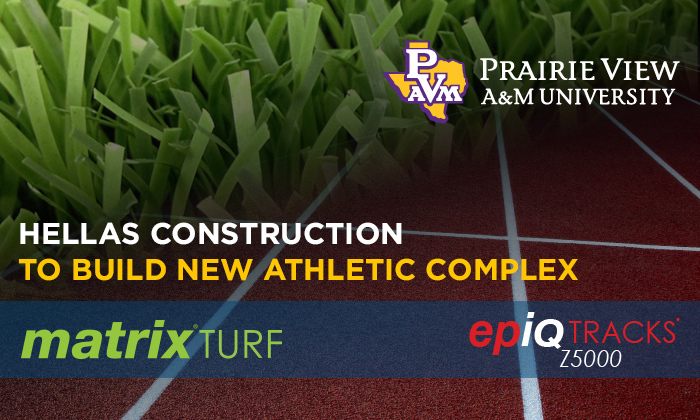 The $3.72 million dollar project begins next week with the construction and installation of an epiQ TRACKS® Z5000, an IAAF certified running track that offers superior control, cushioning, energy return, and performance. The project also includes the construction of field event areas for javelin, high jump, pole vault, shot put, hammer throw, steeplechase, and others. Hellas will switch gears in January and begin the construction of a Matrix® Synthetic Turf football field for the Prairie View A&M Panthers, a product known to enhance playability and performance by offering superior traction, increased shock absorption, minimized “fly-out”, and better foot control. The project will finish with the installation of covered bleachers that will hold 1,000 attendees at the facility. The Panthers have announced a lineup of exciting events to be held at the facility, including the United States Olympic Training Camp during the month of July 2016. Prairie View A&M, a charter member of the Southwestern Athletic Conference, also plans to host the Prairie Relays on March 26 and a Collegiate Invite on April 16. Headquartered in Austin, Texas, Hellas Construction is a nationwide contractor with a strong reputation for delivering premium-quality sports construction projects across the United States. Hellas has the ability to custom-manufacture and install its own synthetic surfaces for field sports, running tracks, and tennis courts, by controlling all related operations. For more information, visit hellasconstruction.com and matrix-turf.com or follow them on Twitter and Facebook. Prairie View A&M University is a university located in Prairie View, Texas and a member of the Texas A&M University System. PVAMU is also a charter member of the Southwestern Athletic Conference and competes in NCAA Division I in 16 varsity sports teams. For more information, please visit http://www.pvamu.edu.